Individualists with a love for design and looking for something special may find the exclusive object of their desires in the new Adamo XPS. Flat, elegant, chic, and still functional? We had a look. 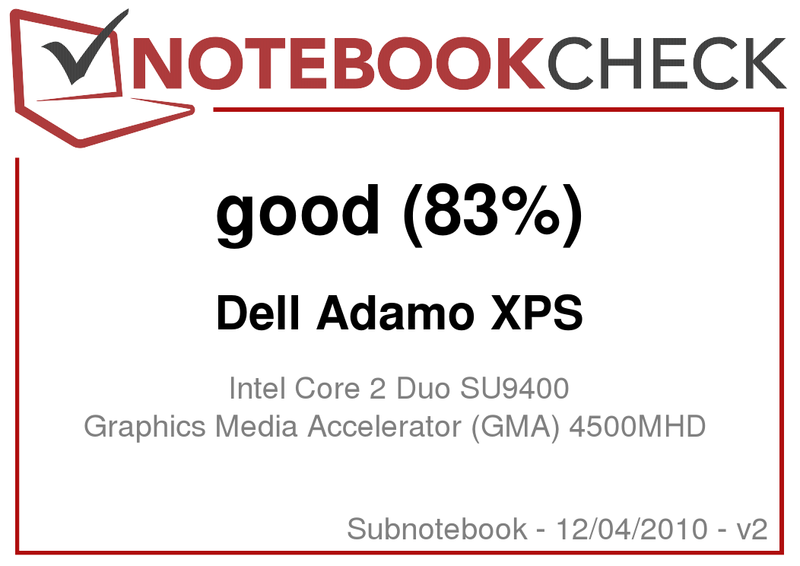 Dell's Adamo XPS is exceptional in many respects. The extravagant display construction, the altogether ultra-thin case, the upscale materials and not least the very chic design carry on the well known virtues of the Adamo Thirteen completely. Yet standing before us is a completely newly designed model which significantly differs from its kin visually. 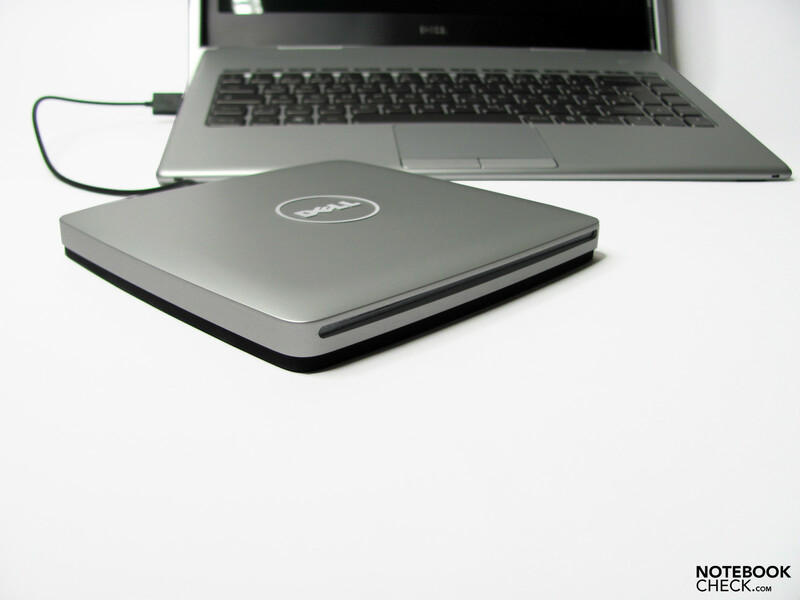 It is clear from the get-go that Dell defines this series more as a feasibility study than as a broad mass production piece. Perfect prerequisites to makes a name for oneself as a status symbol or prestigious object among connoisseurs. 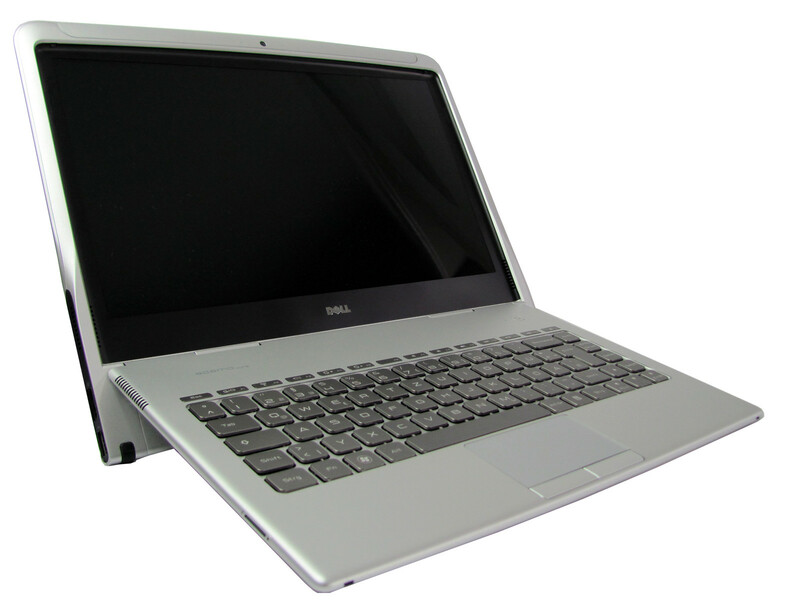 Our test sample is equipped with a Core 2 Duo SU9400 processor, a 128GB SSD, and 4GB RAM. The entry level price is currently 1748 euro. The main goal of the developers was to make as thin a case as possible in order to find out how far one can go with current technical capabilities. They achieved a height of 9.9-10.3 mm (thinnest and thickest points when closed), which "feels" even better in practice than one would guess given the theoretical values. 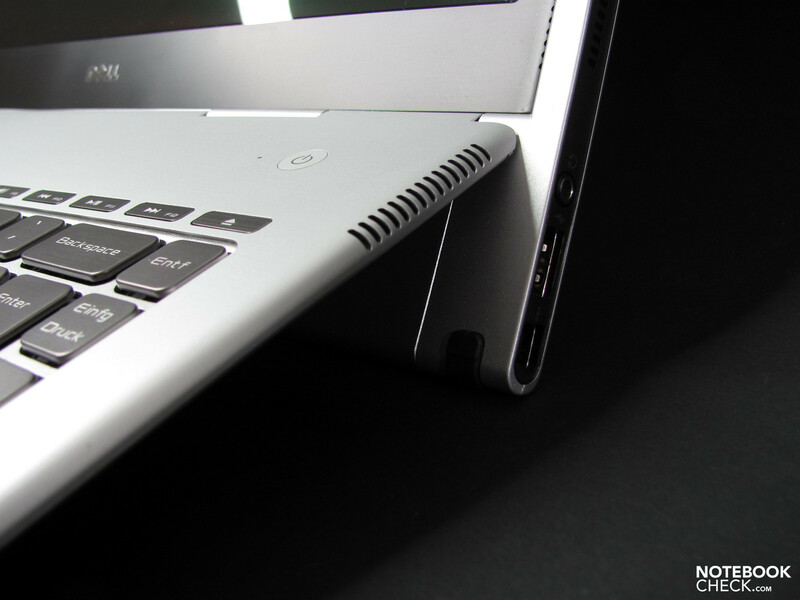 If one takes the absolute thinnest point, like Apple does on the MacBook Air, we even measured under 5 mm at the furthest edges. 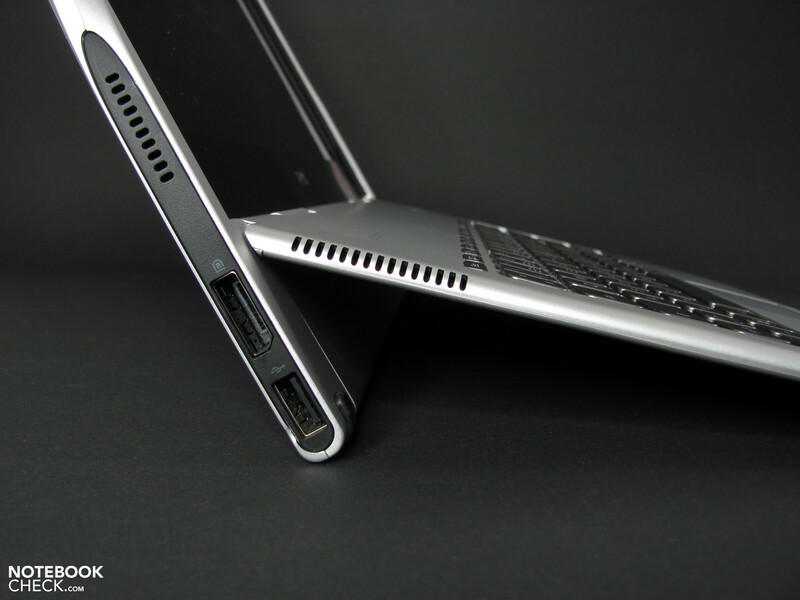 The Dell solution profits most from the modest maximal height, which at 10.3 mm protracts half as much as the MacBook Air and thus seems an entire size slimmer overall. 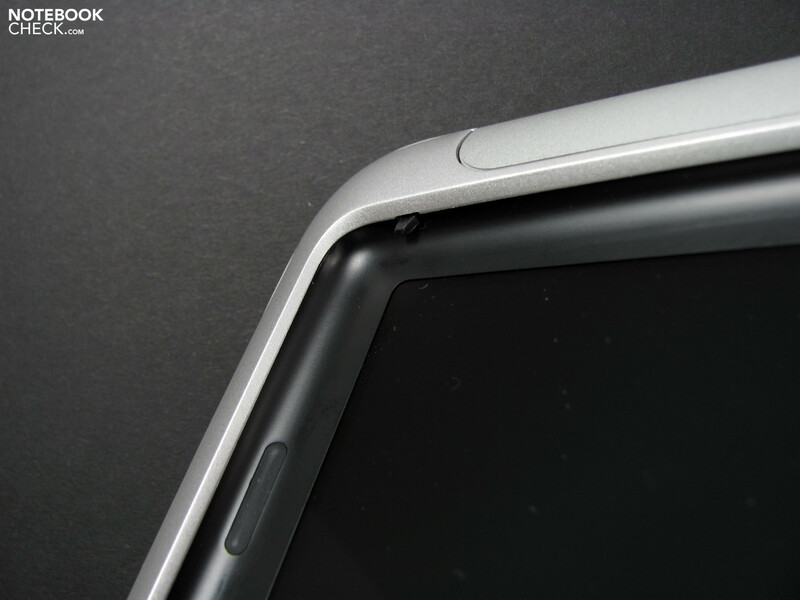 Even the iPad from Apple with a thickness of 13.4 mm is undercut. Somewhat more generous is, however, the width at 340mm as well as the depth at 274 mm, which fringe on 15" territory. 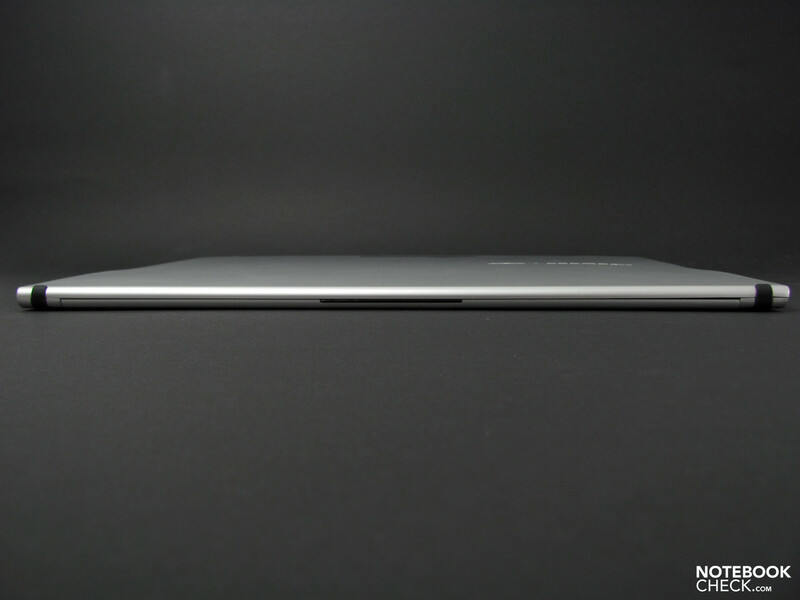 The display surface seems almost undersized in comparison. The weight including the 20-Wh 6-cell battery is 1.44 kg and is in this respect also not entirely on the level of the MacBook Air, which tips the scales at only 1.36 kg including its 40-Wh battery. The battery on our tester didn't sit 100% right and would only allow itself to be extracted with some persuasion. 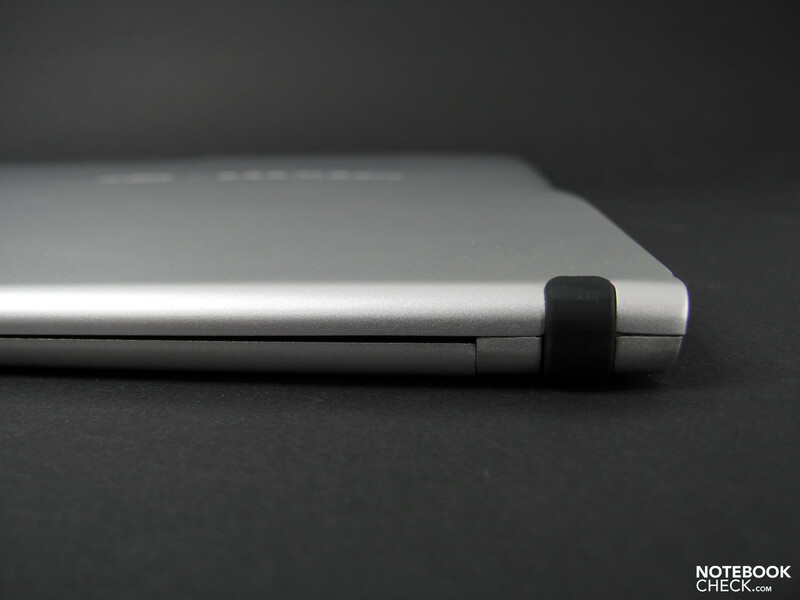 The aluminium panel used, which together with the well thought out substructure allow for such a thin case construction, helps the Sub-notebook achieve a top-quality level of solidness and also rewards the user with a very pleasant surface feel. Not entirely as was hoped for, however, was the accuracy of fit of some elements, which to be fair is more noticeable than usual due to the slender construction. The surface is lightly roughened and can therefore be considered very low-maintenance. Bid fingerprints goodbye. Unlike the Adamo Thirteen, the Adamo XPS can only be had in an aluminium-toned Variant. The case, which when closed makes a perfect unit, houses some of the technical components in the extended display segment. 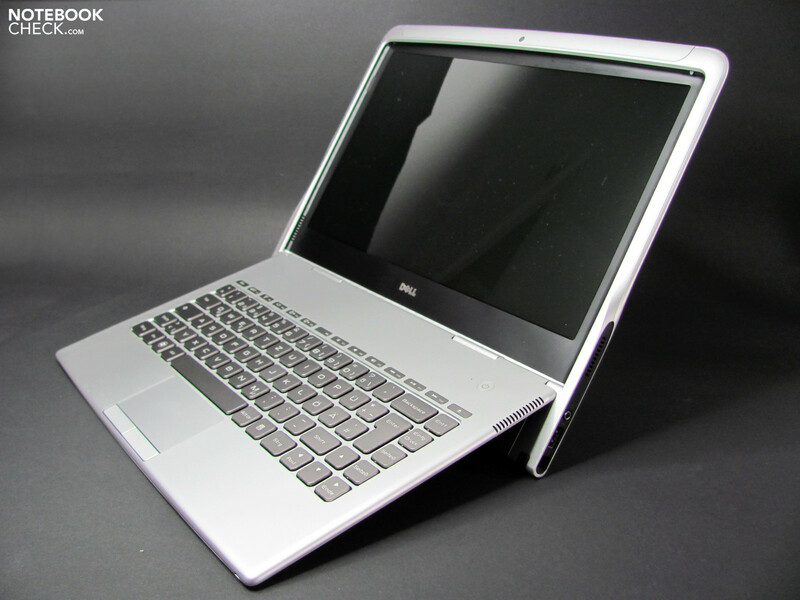 The actual display frame was strengthened and got a distinctive kind of clamshell design. For purely practical purposed, this prevents foreign matter from getting into the space between and causing damage. 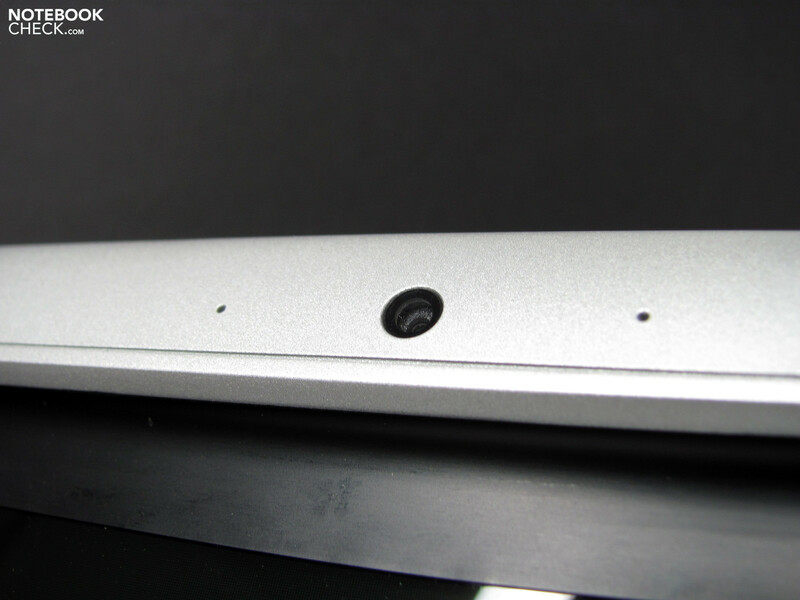 The webcam on the other hand sits virtually free on the underbody and has no protection. 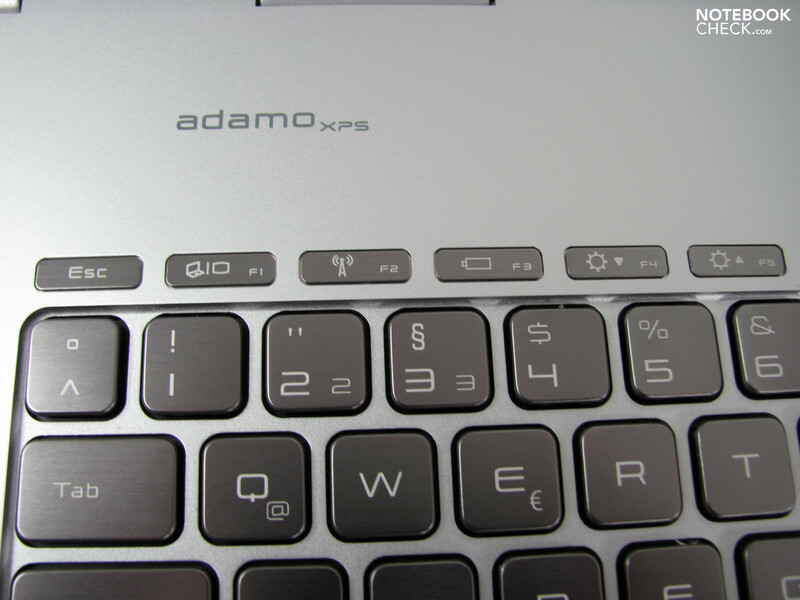 The otherwise familiar base unit on the Adamo XPS seems to consist only of the keyboard and thus contrasts the normal image one has of a notebook. 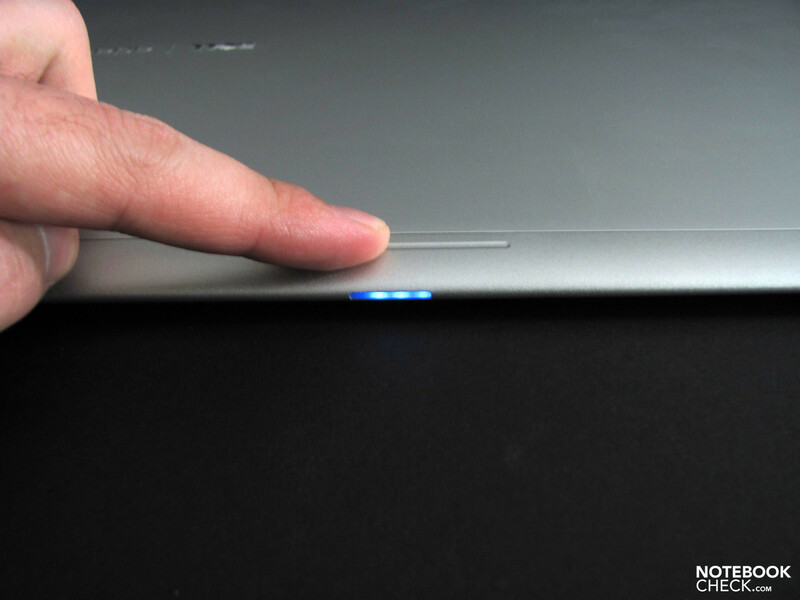 In order to open the notebook, Dell integrated a sensor key on the front edge, which acknowledges the order with a luminous blue light and finally unlocks the latch. But that neat gadget stays closed without a current supply, battery or power adaptor and one must struggle with a separate release latch. 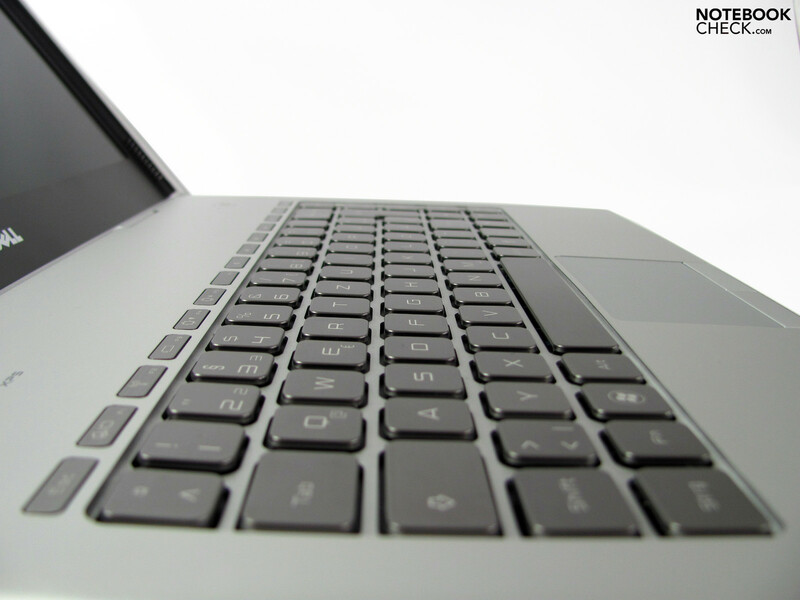 When opened, the keyboard and the display screen are at an at first unfamiliar sloped angle. It is certainly appealing visually. We will explain how this affects its practicality in the parts dealing with connections and display. The stability at least suffers from this construction as even slightly uneven surfaces cause it to tip. We also miss a lock or fixing on the display in upright position which adds to the impression of instability. Usability on ones lap: pretty much out of the question. Delivered is a standard battery with 20-Wh, which tips the scales at around 175g, and the additional 40-Wh battery available at around 300g. (currently not offered in Europe). The battery drive is found at the rear and as is usual has a separate latch. Getting to the system's components requires some courage as one must carefully open the case around the keyboard with a load of screws. We did not open our tester; rather we consulted the technical sheets. 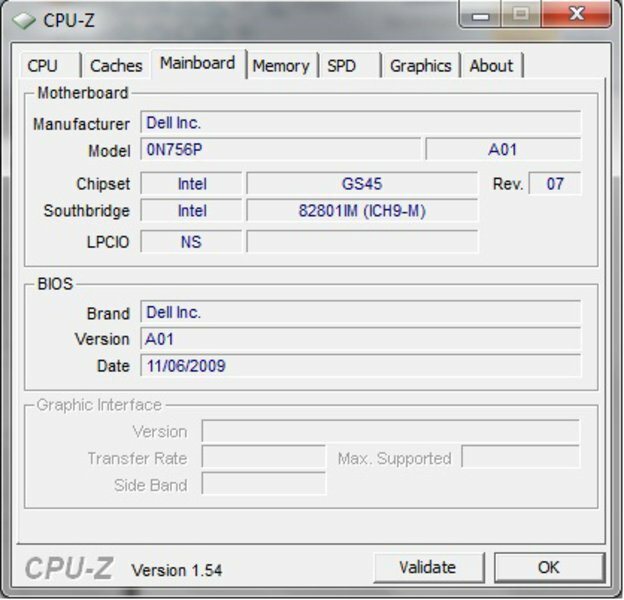 Above the input is the CPU, chipset graphics, RAM (1 slot) and case fan; working below the keyboard are Bluetooh, W-LAN, the SSD and a jumper batter (more on that in the capital on battery life). In terms of connections, the Adamo XPS takes the view typical of this class: Less is more. Directly integrated in the case is a DisplayPort, two USB 2.0 (max. 27.6 MB/s), and the power and headphone connections. One does not find a separate microphone input for use of a headset, and must therefore rely on the microphone integrated into the display's frame next to the 2.0 MP Webcam. A combined USB/eSata solution was also not managed, perhaps due to a lack of space. Additionally, DVI and 10/100 Ethernet are available through a hardlock. The interfaces, which as mentioned are all found in the rear, are easily accessible and shouldn't cause any trouble when hooking up peripheral equipment. HDMI and VGA can also be had through a hardlock, though in this case at a premium. Wireless connections can be made by both Bluetooth 2.1 and with W-LAN Draft-N. A UMTS module is not integrated and Dell says that though it was originally planned, it will not be available in the future. 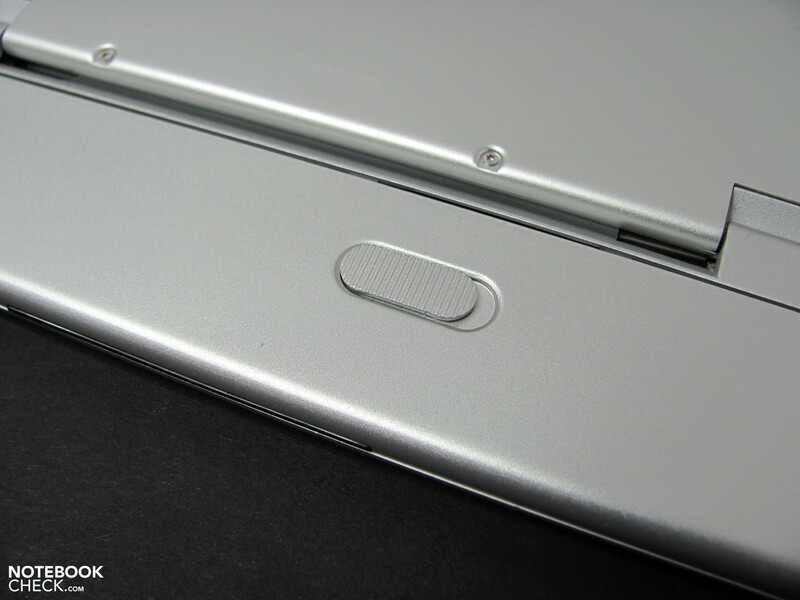 The laterally integrated SIM card slot thus remains permanently useless. The bottom line is that unlike the Adamo Thirteen, users will have to do without USB2.0/eSata combo as well as the UMTS modem. 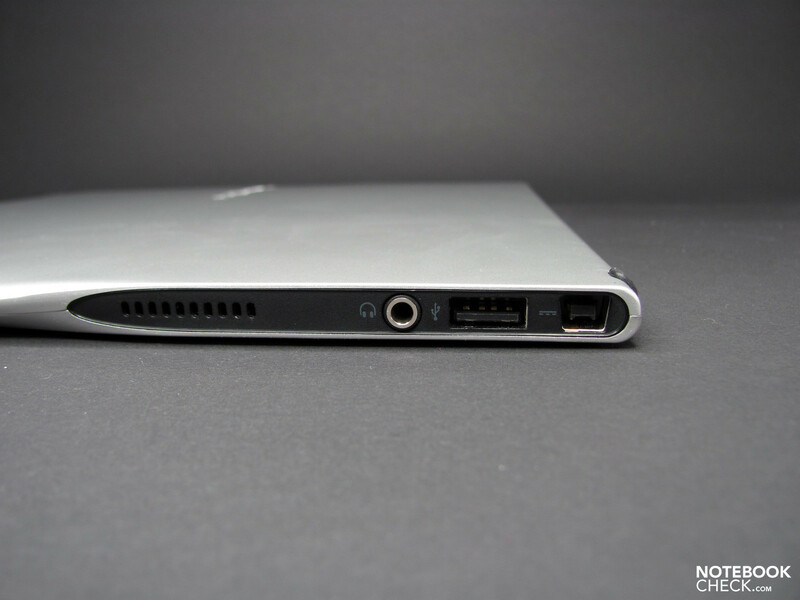 Compared to the MacBook Air, one does have the small advantage of the additional USB 2.0 and the additional adapter. 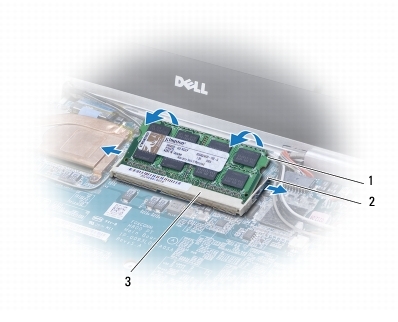 The accessories list is uncharacteristically short for Dell and allows for almost no configuration options. An additional support period, Office package and four different external drivers are offered as options. A DVD burner, Blu-Ray combo or two harddrives (250GB/ 500GB) could supplement the already exclusive hardware equipment list. 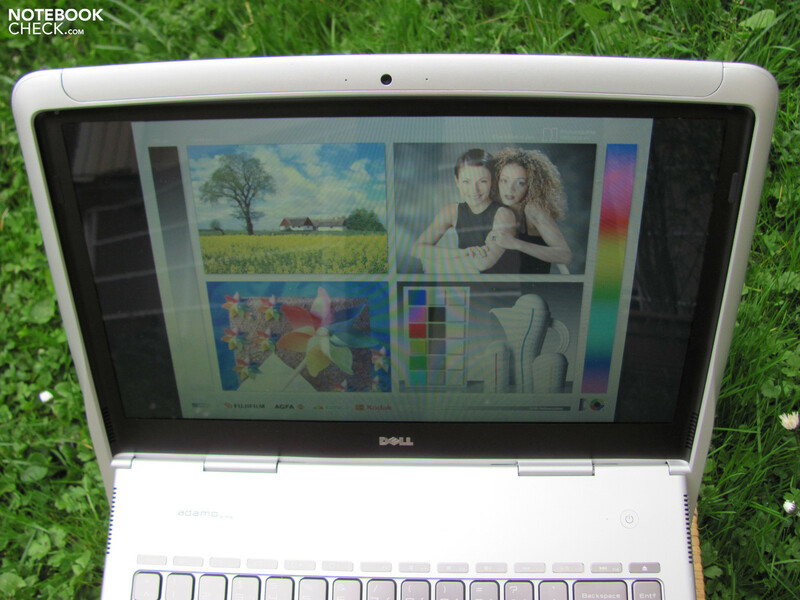 The Adamo XPS is in the meantime no longer available directly from Dell as all the machines available for Germany are now sold through the electronic chain Media Markt. It remains to be seen how many of the original enhancements will be available through this channel of distribution. 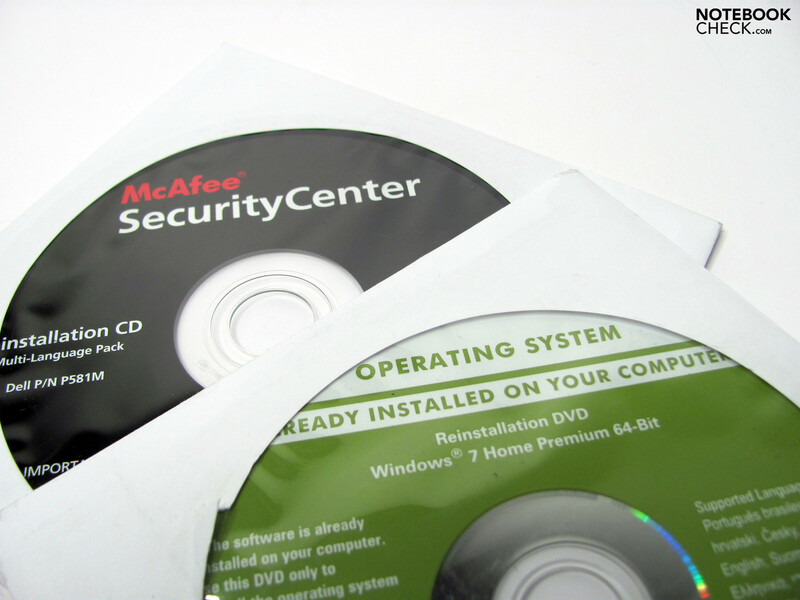 Apart from that, a 1 year guarantee, Windows 7 Professional 64bit and a couple of well-known preinstallations are not what one would expect from a product in this category. 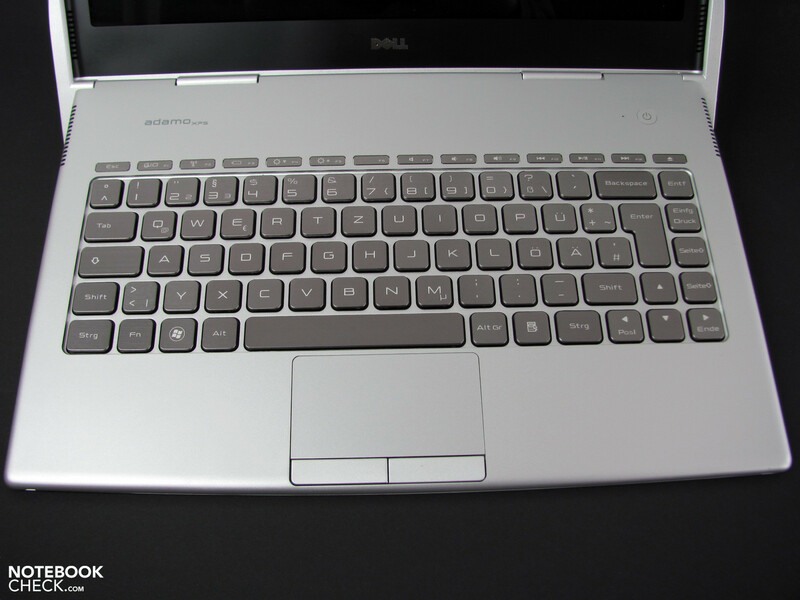 Dell seems to be being a bit stingy, even if the Adamo XPS is intended primarily as a feasibility study. 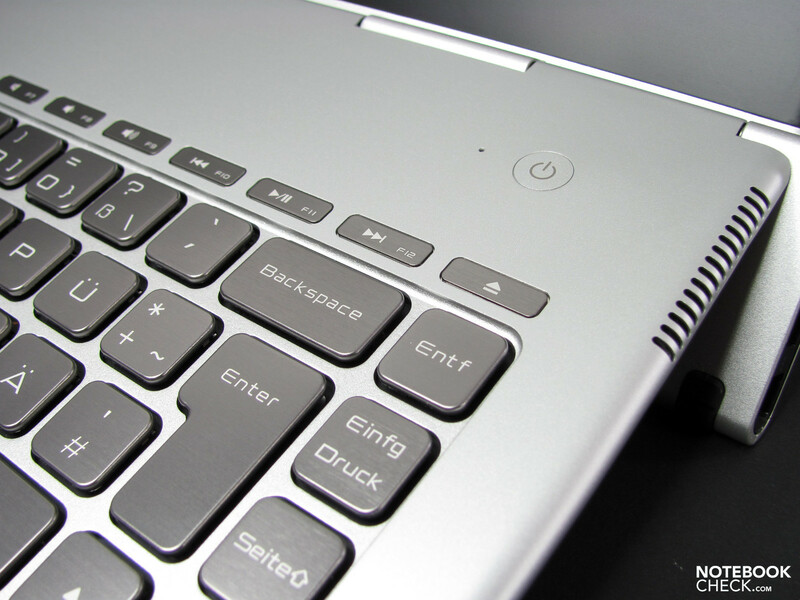 Unlike the Adamo Thirteen, the Adamo XPS does not have a backlit keyboard. The "normal sized" keys arranged in a Chicklet-pattern have a poorly contrasting labeling which is hard to read in bad lighting. A metal material is also used here which gives a very upscale impression and delivers a rich tone. 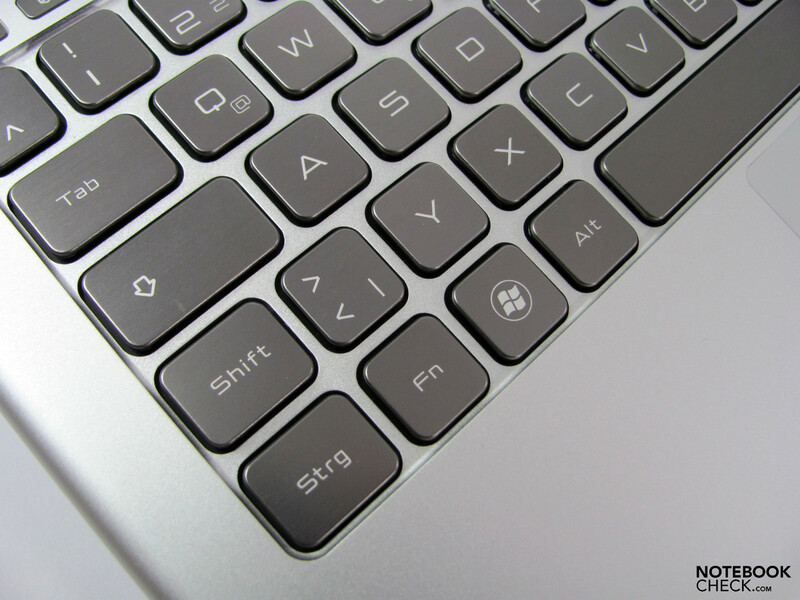 The FN-keys lie separated outside of the main input field and make up a part of the many design elements distinguishing the Adamo XPS. When one begins typing, the unusual slope of the keyboard initially seems disturbing. But after some time settling in, one quickly orients himself with it and learns to appreciate the relaxed hand position when touch typing. This is mainly achieved due to the fact that the palms rest is better than normal and that less accommodations must be made for the fingers to reach the keys. This is however a very subjective assessment. Depending on custom, one might also consider this irksome. Despite their limited space, the keys have a moderate stroke with a good stop. Overall, this lends itself to a pleasant writing experience. Nothing sags here. 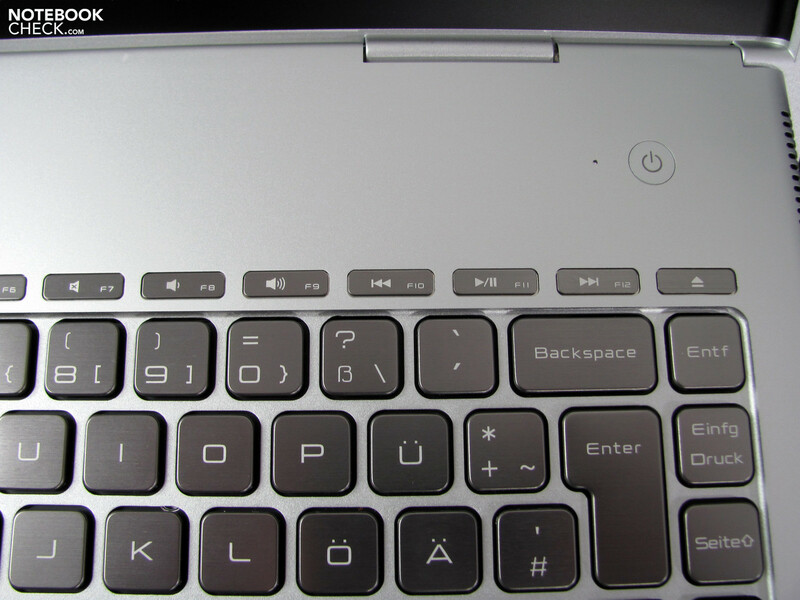 The touchpad is quite large and has two separate enter keys. The sensitive surface lies a bit deeper in the palm support and draws attention with its edging when one ventures outside of the input area. 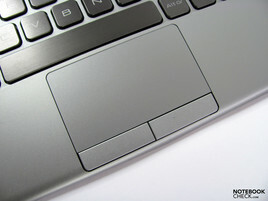 The sensitivity when clicking and moving the cursor is good and the sliding qualities allow for fluid working. Familiar multi-finger maneuvers are also supported. 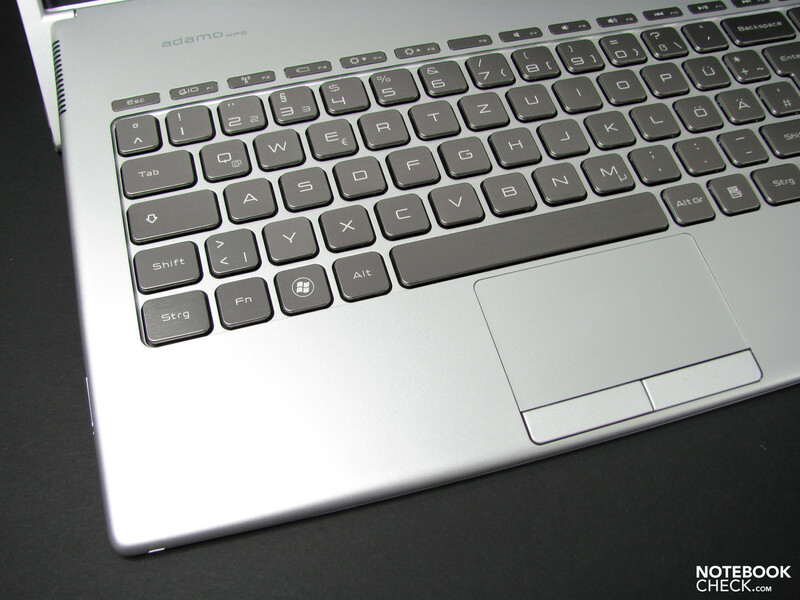 The touchpad keys are smooth and have good reactions which make them pleasant to operate. 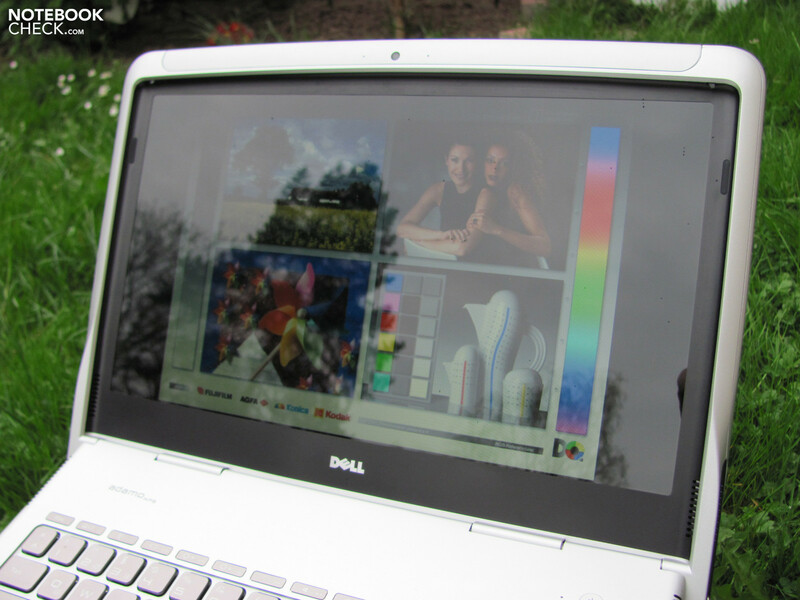 Dell describes its display used on the Adamo XPS as "innovative", thereby of course fuelling the expectations of potential buyers enormously. What we find, however, is not really extraordinary. A 13.4" WXGA widescreen display in a 16:9 format with reflective surface are things we already know from many of the rival models and can only be described as plain fare. It is quickly clear that "innovative" can mean nothing more than the unique design. As we have already dealt with this issue in the case-chapter, we will now devote our attention to the inner qualities. 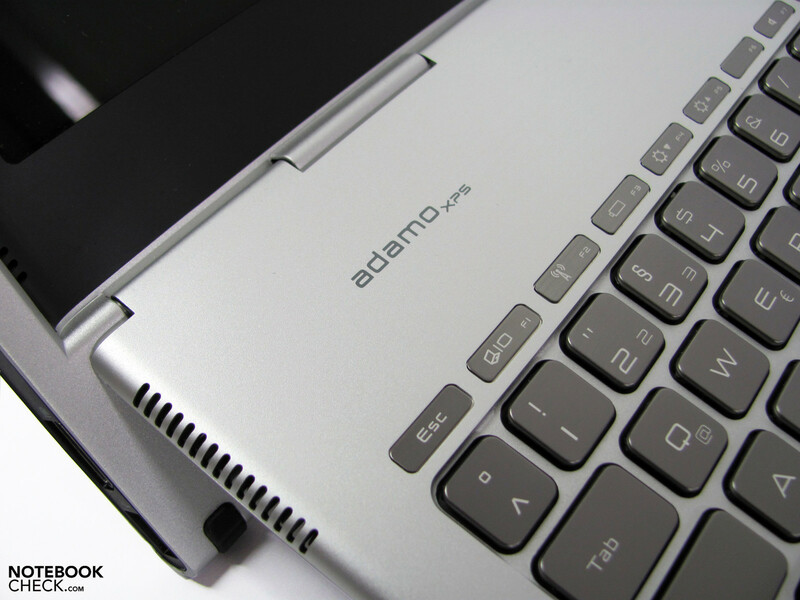 In keeping with today's standards, the display screen built into the Adamo XPS has a LED backlight and is labeled as a 720p display. As guessed, rather than the 720p's normal 1280X720 pixels, we find in reality a resolution of 1366X768 pixels which corresponds to current notebook standards. The HD-Material is not presented entirely balk-free, but it does have a small advantage over the old 16:10 format. Compared to the 16:10, one must however do without some pixels on the vertical plane, something which limits its ability to accommodate documents and browser windows, and demands more scrolling. 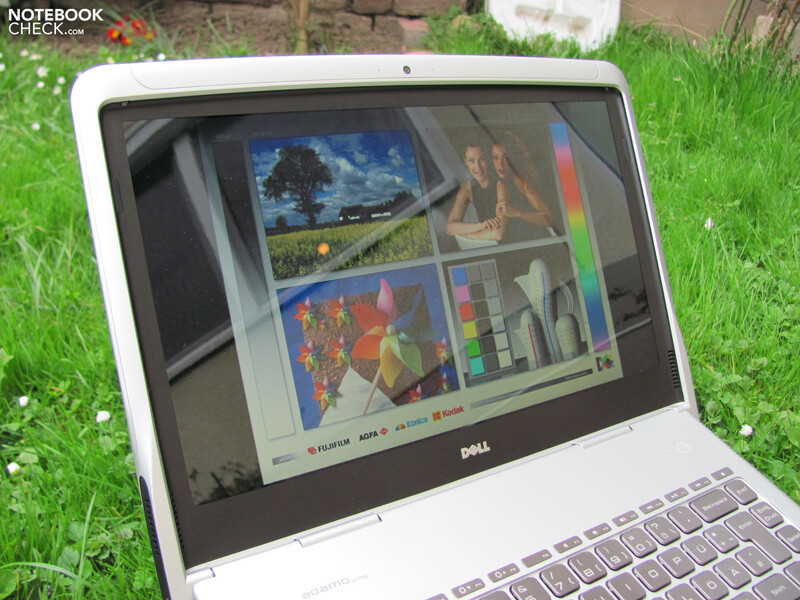 The display measurements and the resolution yield a pixel density of 119 dpi and, such as is normal on 13" notebooks, represents a good compromise. 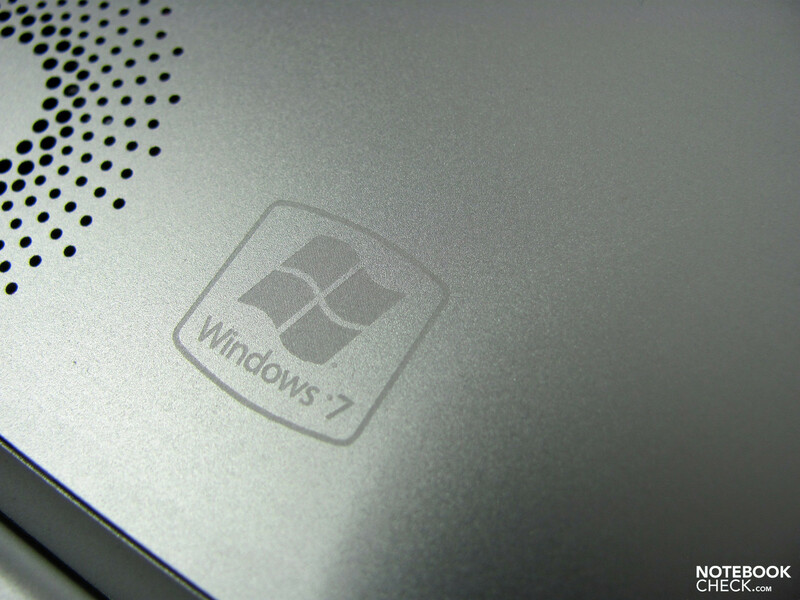 The desktop offers the same surface as on most 15.6" notebooks without making symbols and fonts too small. The display's brightness can be regulated in 15 increments and achieves an enormous max of 335 cd/m². 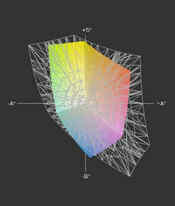 The display can be dimmed to 32 cd/m². A suitable brightness for indoors is around 100 cd/m² and is achieved on level 4. At this point the first disadvantage of the panel surface are already clear. Due to reflections, one can not resist turning up the rather ergonomically favourable brightness until the reflections are outshined and loose their dominance over the actual picture. The irregular illumination of 75%, with a brightness loss reaching to the opposite edge, is not recognizable in normal operation. The difference of max. 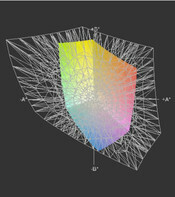 80 cd/m² can only be seen on monotone backgrounds. In the outdoors, however, one can't get enough brightness and gladly makes use of the display's maximum output of 300 cd/m². Image content is easily recognizable but superimposed by surrounding reflections. Though the mirroring effect seems more minimal when compared to its less intensively bright competition, one must continually concentrate in order to filter out the actual program or desktop information. Though the contrast of 219:1 is somewhat above average in comparison to otherwise customary measurements, it does not deliver full black. 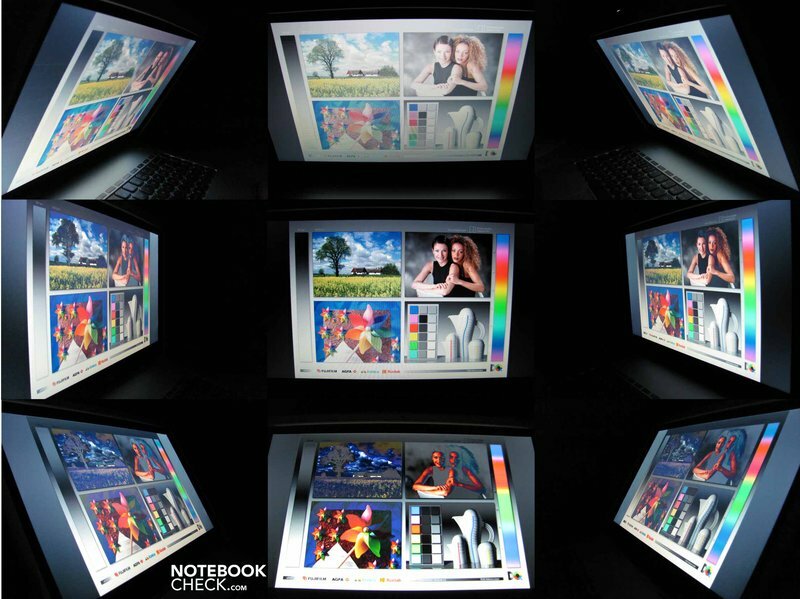 The colors are hardly stronger than we have seen on other notebook displays but thanks to the glossy surface do seem somewhat more brilliant than on matt screens. The color space is around 62% of the sRGB's color space and 42% of the Adobe RGB's color space. This does not set the panel apart from standard notebook displays. For picture editing, it would be preferable if it could at least cover the sRGB color space. 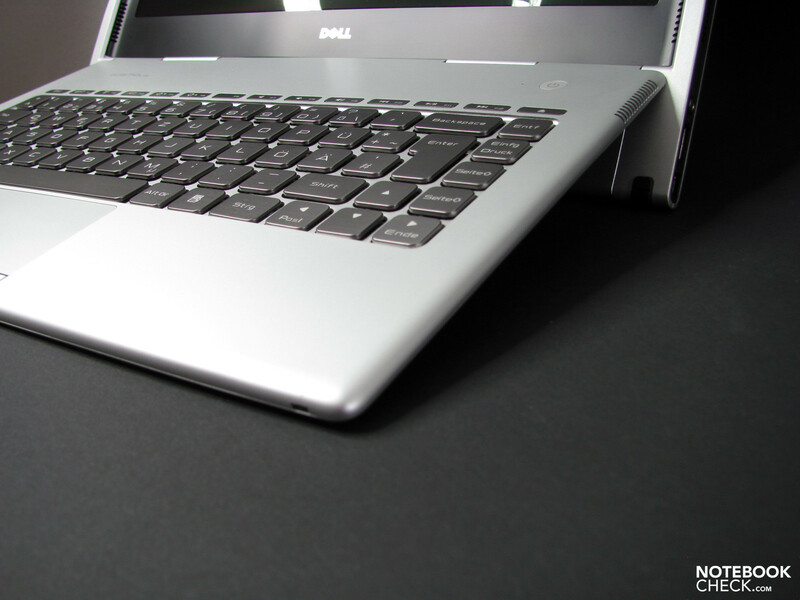 Due to the case construction, which we have mentioned numerous times already, the Adamo XPS doesn't allow for any adjustments of the display angle. In order to prevent the fixed position from being a detriment, the user is particularly reliant on a panel with high view angle stability. Horizontally, our tester succeeds in doing this quite well. The colors distort only slightly from the side and the content always remains recognizable. Vertically, where, as mentioned, we are forced to live with a fixed screen position, even minor position shifts change the colors to the point where they are inverted or washed out. Contrary to common practice, the image can't be improved through changes in the display's angle, rather one must lift or sink their head. Based on the overall concept, we expected more in this respect. 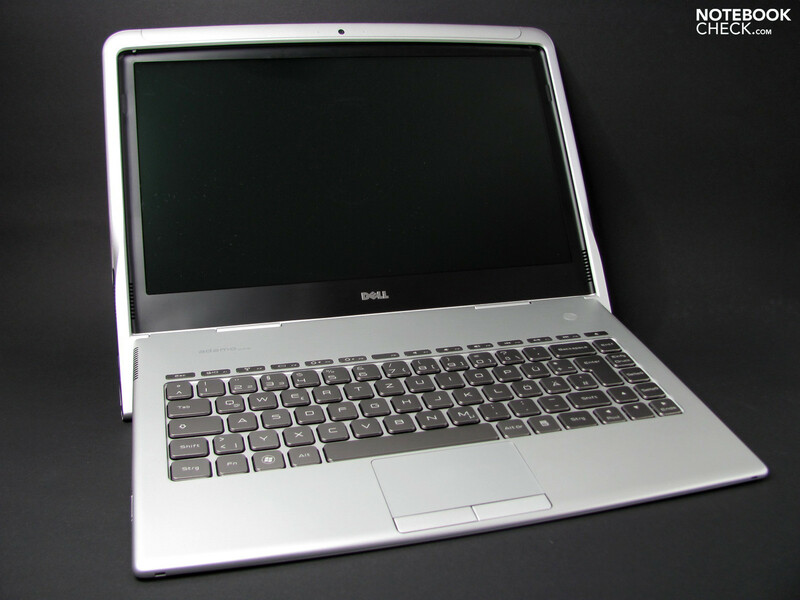 The Dell Adamo XPS uses as its basis the modest Intel GS45 chipset (Cantiga), which received sufficiently potent components in the form of an integrated GMA 4500MHD graphic card and an Intel Core 2 Duo SU9400 processes. 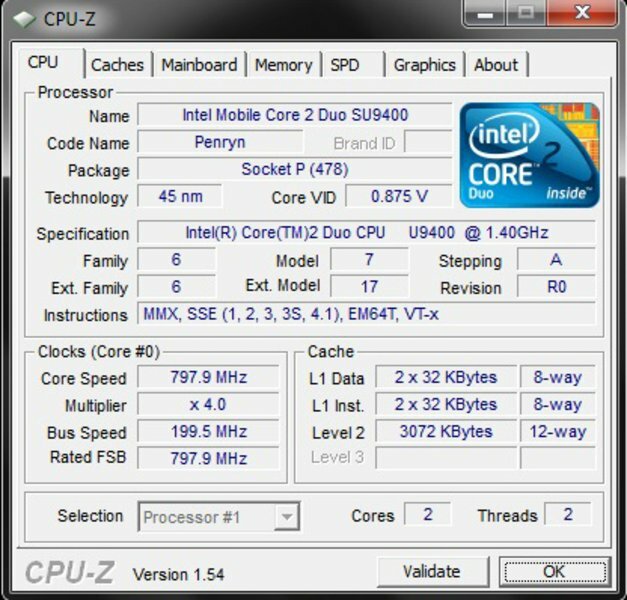 The 2 core CPU (Penryn) has a clock rate of max. 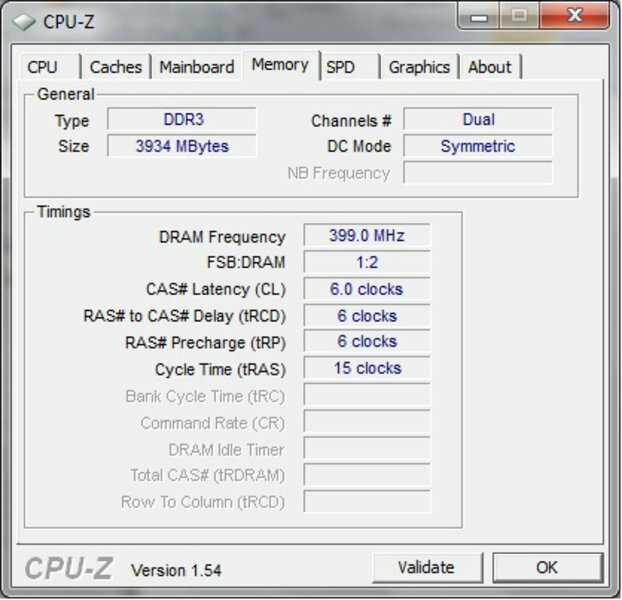 1.4 Ghz, a 3 MB L2 Cache and a FSB of 800 Mhz. 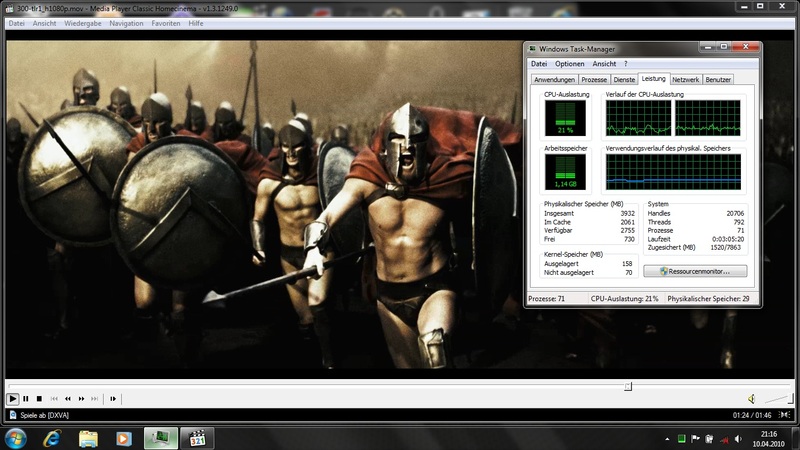 In terms of memory, one can fall back on 4GB DDR3. Although the chipset supports up to 8GB, the Adamo is somewhat limited in terms of upgradeability as it only has one slot. 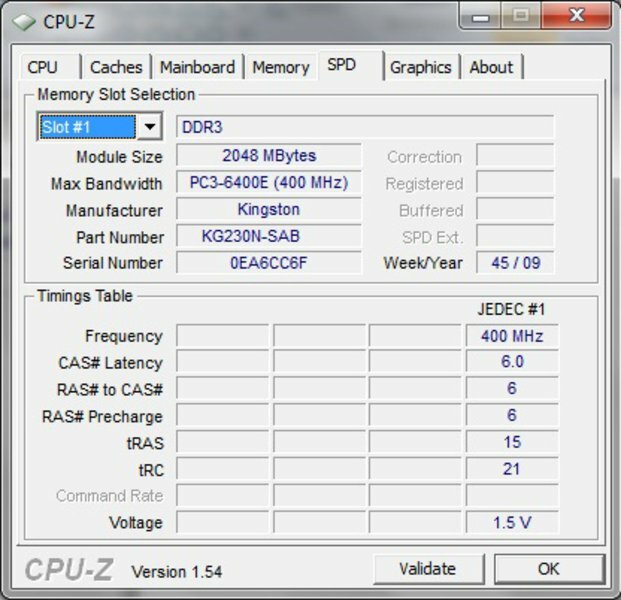 This is fitted with a 2GB module from Kingston and supplements the 2GB installed permanently onboard. 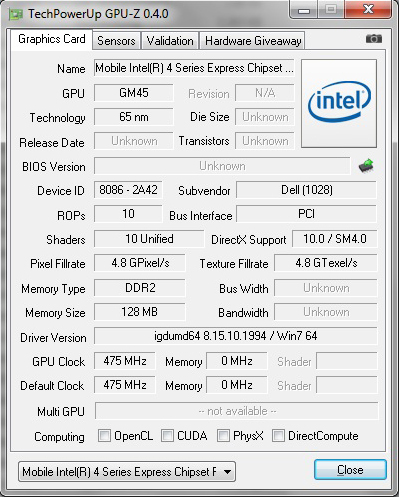 While all of the 2D graphic tasks carried out by us could, as expected, be managed without any fuss, the integrated Intel graphic card is not suitable for elaborate 3D computing. 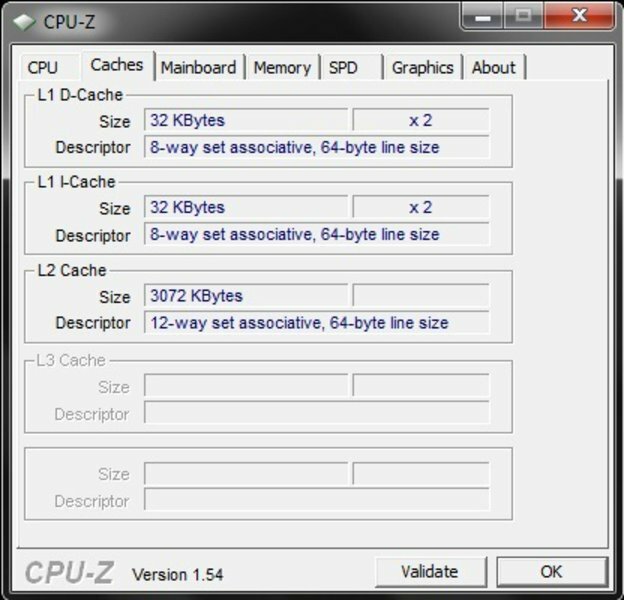 624 points on the 3D Mark 06 or 737 points on the Cinebench R10 OpenGL Shading only allows basic tasks to be managed. The Intel GMA 4500MHD could, however, play HD videos judder-free in 720p and in 1080p resolution with the DXVA video player. Both Flash videos in 720p format and purchased videos from the iTunes store (per iTunes) ran without any lapses. We put our 5 test songs through a date transfer from an iTunes MP3 to AAC and got a transfer rate of 15.3. That is a respectable value which backs up our other CPU tests such as SuperPi 32M in 1916 sec and wPrime in 1877 seconds. Using the Tool DPC Latency Checker, we also examined the Dell Adamo XPS on all possible latencies, particularly those which could be responsible for synchronization errors when connected to external devices. We included the keyboard and W-LAN as well as some external USB extensions. The W-LAN on our tester produced several critical deflections. After we deactivated this we found only ideal measurements. 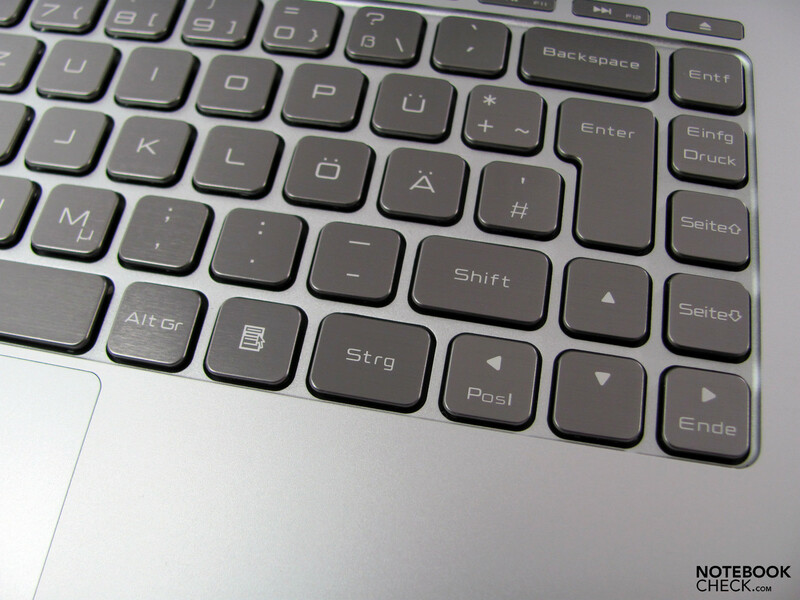 Inputs via the mouse, keyboard or touchpad did not have any negative impact during testing. A Huawei K3520 UMTS stick did, however, cause similar deflections as the W-LAN module. 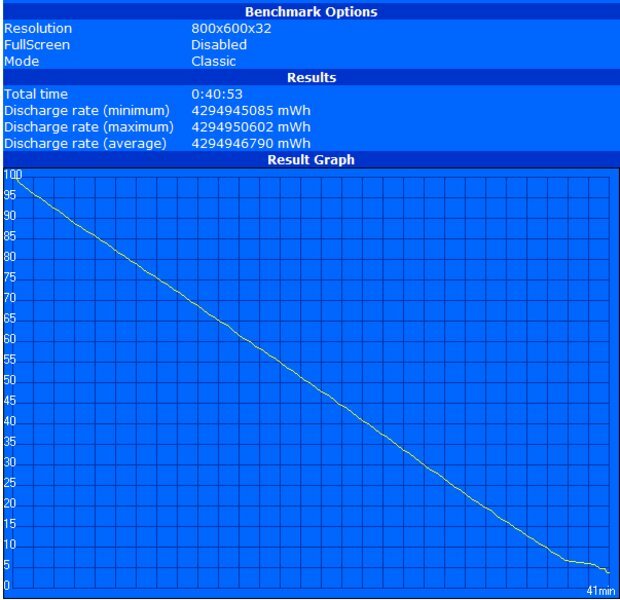 In addition to the program tests we also refer back to the synthetic Benchmark PC-Mark Vantage to evaluate application performance. The 3764 points confirms the impression we got with Office, iTunes, Browser and Photoshop applications. Work is always accomplished briskly and also profits from the fast logging Solid State Drive. For its mass memory, Dell decided on a SSD with 128 GB capacity from Samsung. The memory should typically be large enough for a notebook in this category. However, for those with lug around especially large amounts of multi-media data, won't get around having to use an external data container. But on the other hand one is rewarded with particularly low response times (0.2 ms) and relatively brisk bit rate (144 MB/s on average). 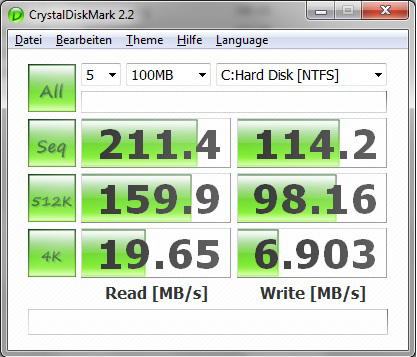 Also in the Crystal Disk Mark 2.2, the hard memory achieved outstanding values when compared to conventional hard drives of this size. The perceived starting speed of programs is very fast. Gaming? With the Adamo XPS? Most likely not. Still, some stressed Managers could be looking for a bit of relaxation with a round of Sims 3 between meetings. This is after all the best selling game and quite modest in terms of its hardware demands. In addition testing on low quality settings with a resolution of 800X600 (27.5 fps), we also tried the standard resolution on an unchanged quality and got frame rates of 21.2 fps. There isn't much room for picture enhancements in one form or another before Sims 3 turns into a slide show. A big advantage of the scantly supported case construction shows up in our emissions tests. 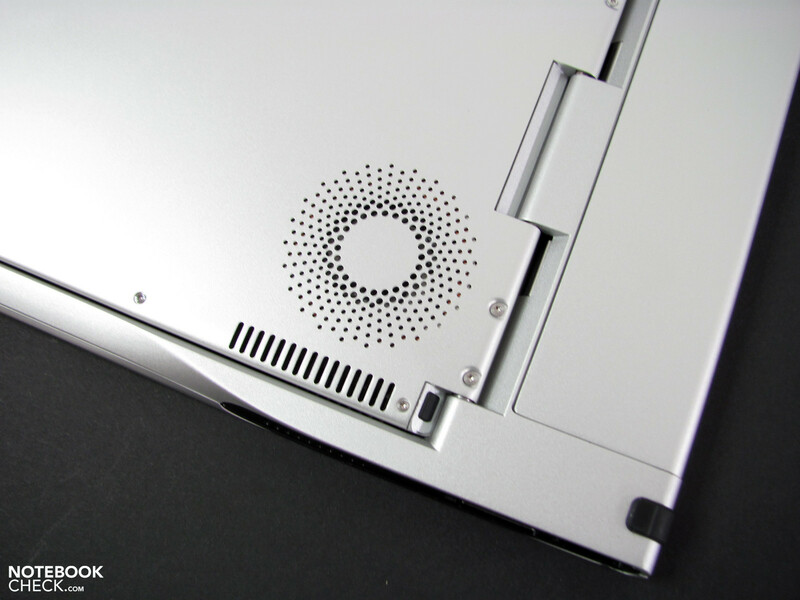 Together with the aluminium shell, the case greatly benefits both from energy saving components and the air surroundings, which don't allow any places for heat to accumulate. The corresponding case fan proves itself to be unobtrusive. It is practically inaudible at all times. With a persistently unchanging rotation, the sound emissions themselves, even under load, don't rise above 29 dB(A). 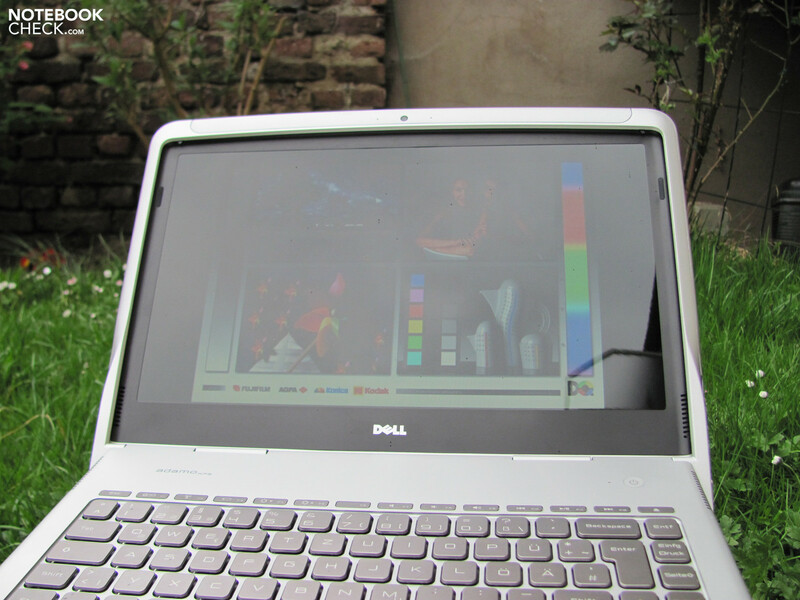 The Adamo XPS is thus quieter than many other notebooks at idle. 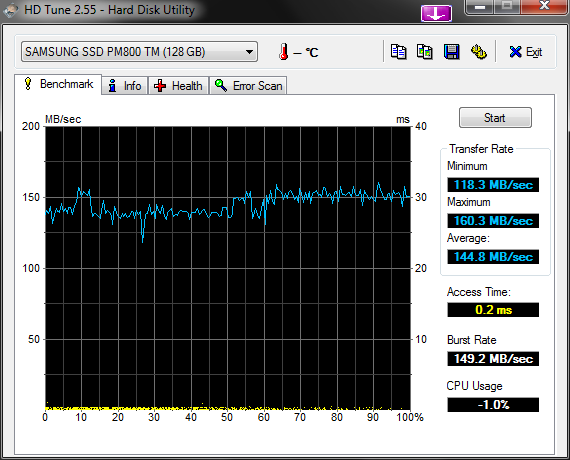 The SSD mass memory pays off here as it silently works and calmly sails around the familiar hard drive rattle. Ideal for sensitive ears. The case temperatures, if one can even describe them as such, are at a possibly record-breaking low level with a max of 38°C and don't give any indications of eventual overheating problems. The aluminium shell itself still feels very cool under load. Only two areas measured on the top become "warm" to the touch. The sound of the loudspeakers, which are both found on the sides of the base, are entirely adequate for Office, Skype and background music. Despite their small construction, they appear to benefit from their position and the way sound is projected as a result from underneath the keyboard area. Despite noticeable disturbances at a high level, the character is overall quite balanced and significantly better than what we are used to on sub- and netbooks. Those seeking more must, as mentioned, reach for a headset of USB speakers. 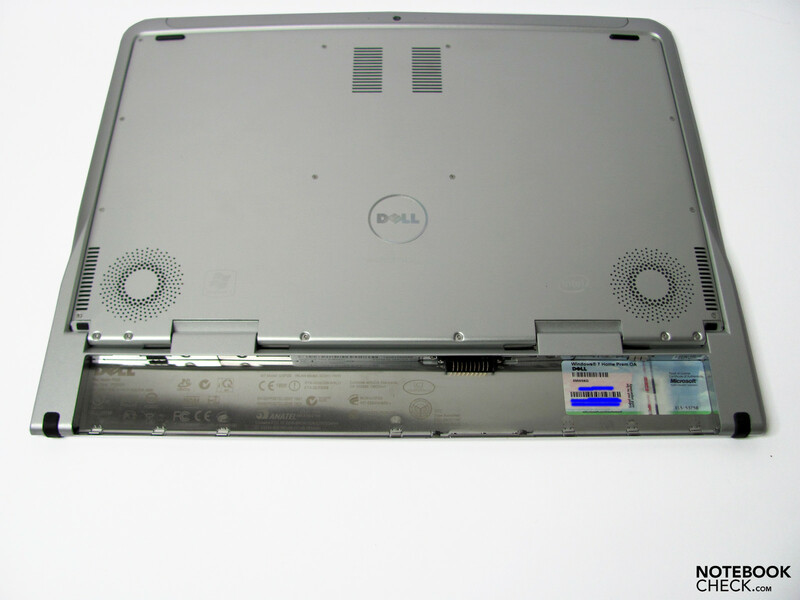 The Dell Adamo XPS has as standard a 20-Wh 6-cell battery which is not permanently installed, rather can be changed while in operation (sleep mode). The energy supply needed for this is delivered by a bridge battery integrated in the palm rest area. 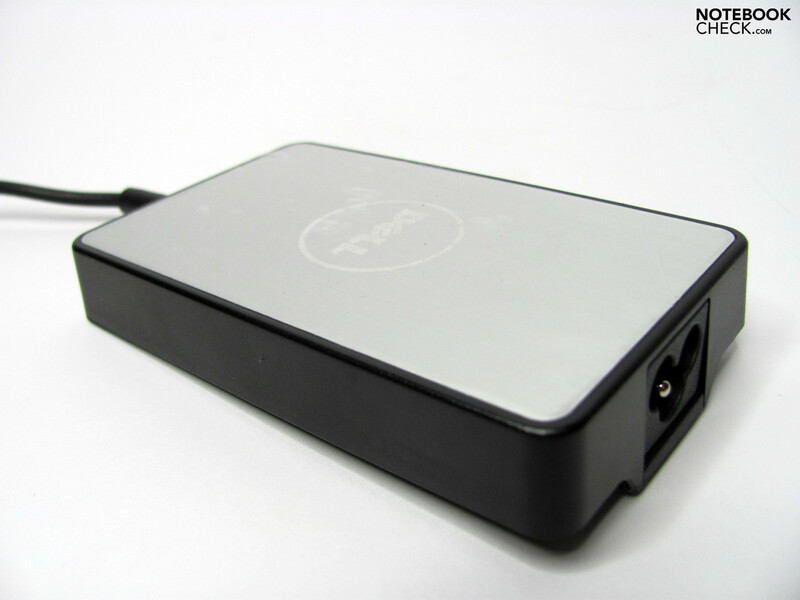 Alternatively, or as a supplement to the standard battery, Dell offers an optional 40-Wh variant which can presumably double/ triple (together with the 20-Wh battery) the batter life. It is not, however, planned for the European market and will only be available in the USA. 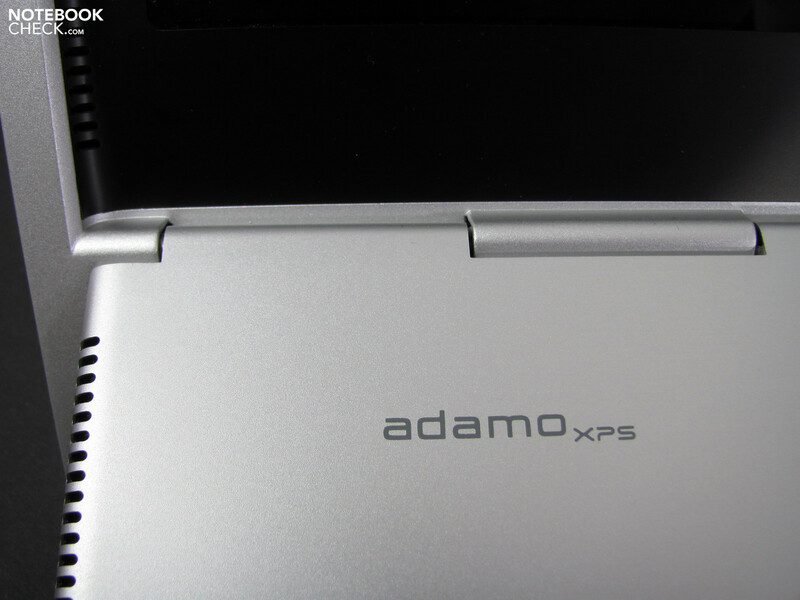 The already mentioned components in the Adamo XPS work together for a quite modest energy consumption. The Cantiga chipset GS45 with a TDP is quoted at 12 watts and the SU9400 CPU with a TDP at 10 watts. In addition to that are mainly the LED display, the SSD and the radio modules. 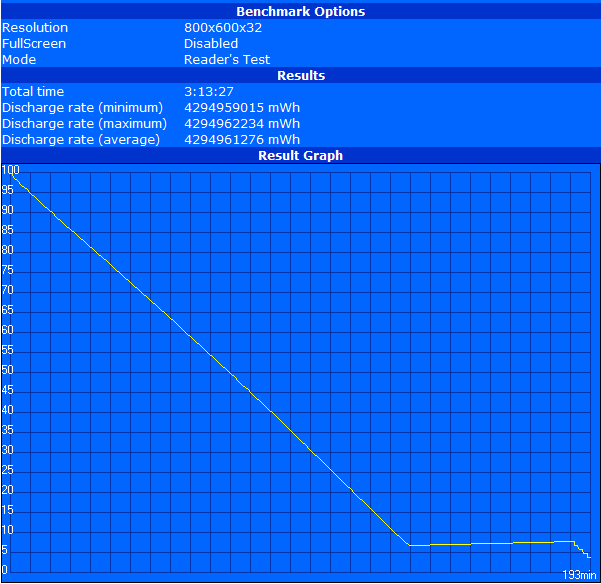 Altogether we measured consumption at a value of 6.4 watt at idle up to 26 watt under full load. Those are very respectable numbers which attest to the testers above average frugalness. The Adamo can not, however, convert these values into a particularly long battery life. The battery's capacity of 20-Wh is simply too small. With maximum energy saving settings (dimmed display, all components off), the Battery Eater Readers Test (maximum possible life) revealed a relatively respectable 193 min, but on more practical settings (adjusted display, W-LAN on) reduced the life while "internet surfing" noticeably to 138 min. The system played back one of our film files for 84 min. That is in most instances too short and the end would be missed. Under full load with all energy consumers and a maximum display brightness, the Battery Eater Classic Test (minimal possible life) showed only a weak 40 min. 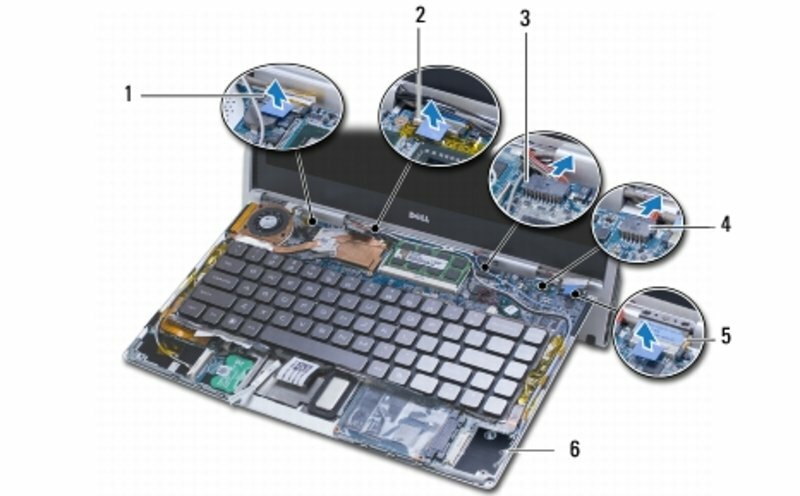 In order to make such a thin case a reality, Dell had to make a few compromises. The tilt of the keyboard and the at times unstable footprint resulting from it could conflict with some habits and demands. Though the standard display is bright, it suffers due to its reflective surface and the user's dependence on the viewing angle. 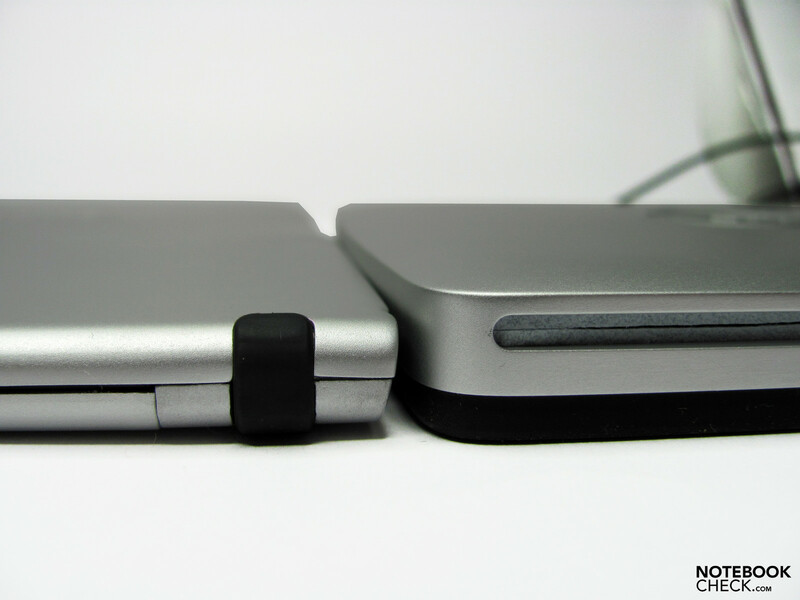 Space issues mean that UMTS, eSata, a Cardreader and an ExpressCard drive are not integrated. Although the Adamo can work quite sparingly, the lifespan is severely limited by the small 20-Wh memory. Small manufacturing flaws dampen the impression of the otherwise upscale materials unnecessarily. But the Adamo XPS can also inspire. 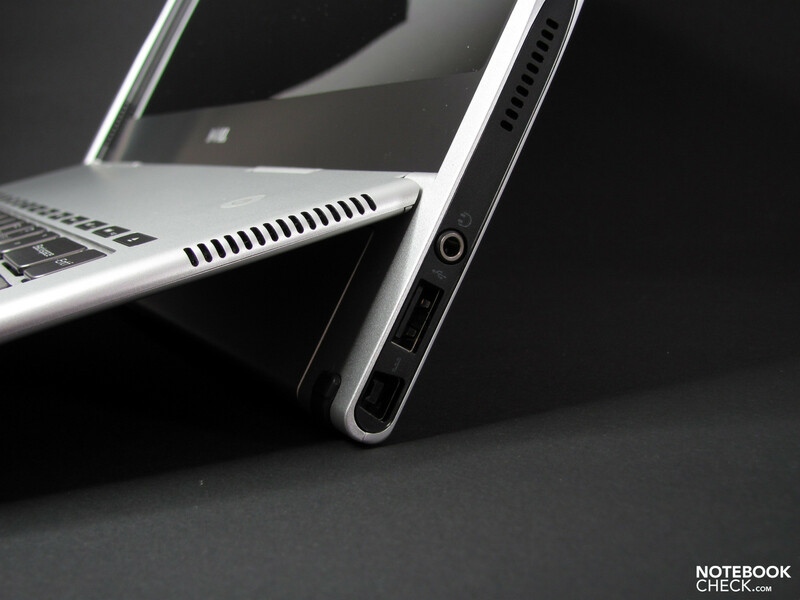 As thin as a calculator, it has a unique allure. The thin piece fits effortlessly in any briefcase and can beat out some writing pads in terms of lightness. The "always-at-hand factor" is well achieved. The performance capability is respectable for the target buyer group and benefits particularly in day-to-day use from the fast Solid State Drive. 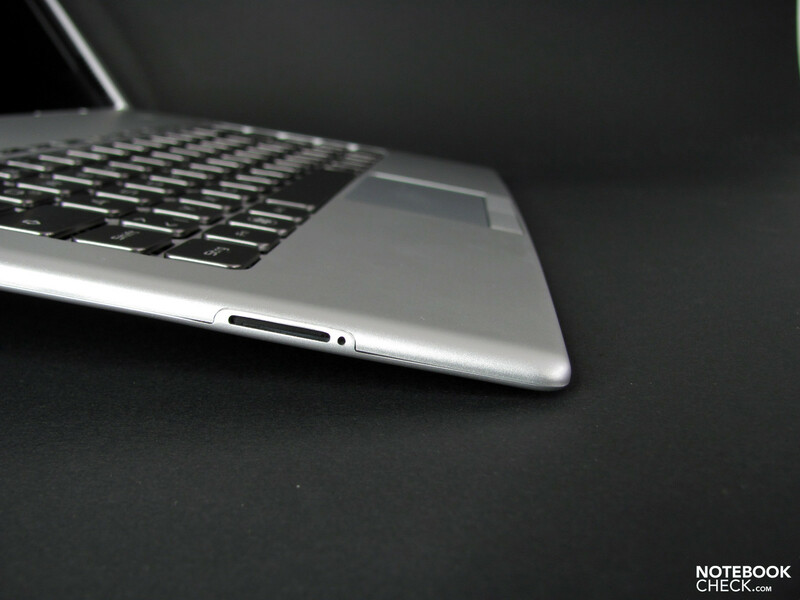 The subnotebook always stays quiet and cool in every situation. 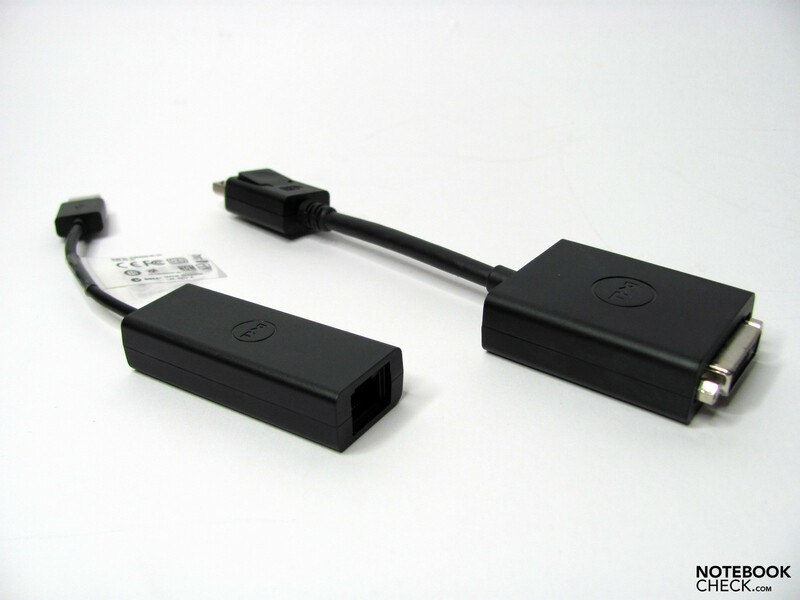 The available interfaces are adequate and can be supplemented with several external adapters. Finally there is the unique design, which with its chic details will be sure to draw attention. Considering its price, one might expect the Adamo XPS to be well served by a 3 year guarantee, an additional 40-Wh battery or an external visual drive included in delivery. Tech enthusiasts, however, will either have to make do with one or two comprises or dig a bit deeper in their pockets, as these options will actually raise the base price of 1749,- euro. Thick display frame with enough space to accept the narrow base unit. 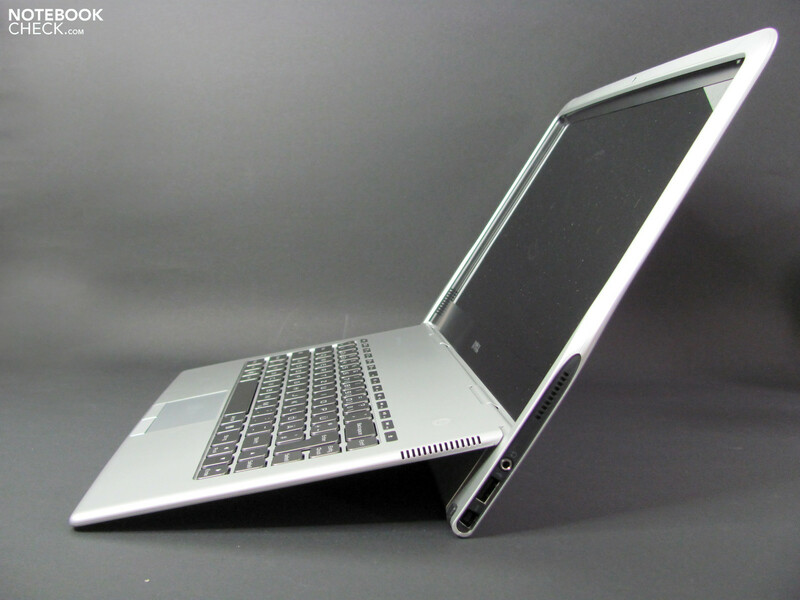 Very thin, very quiet, upscale materials together with good application performance. A more suitable display, more stable stance and the 40-Wh battery. 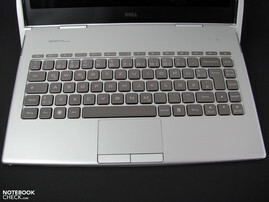 The Dell housed all the necessary computing components in the 6mm thin keyboard element. 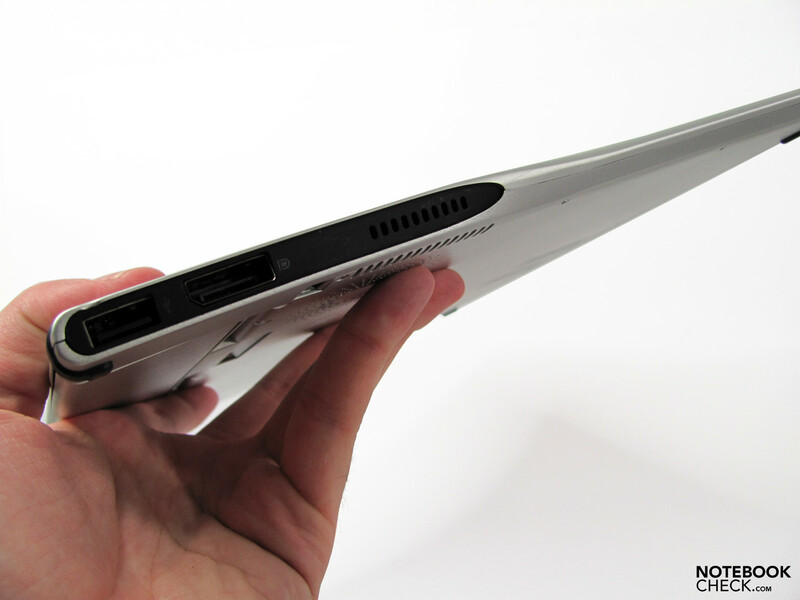 Apple MacBook Air, Lenovo X301, Samsung X360 and Dell Adamo Thirteen may not be as thin, but they do have other qualities. Battery life, equipment, weight, display and also the price are important factors there. But none of them are as quiet as the Adamo XPS.